Approximately 144 miles North of San Francisco on California’s Highway 1, lies the quaint, seaside town of Elk. If you are looking for stunning ocean views and quiet serenity to get away from life’s everyday hustle and bustle, you’ve come to the right place. Redwood forests, lush green pastures, seaside cliffs and crashing surf make for one of California’s best kept secrets. There is no quick way to get to Elk. Whether you take scenic Highway 1 up from San Francisco or come through wine country, you’ll be treated to winding roads along the Pacific Ocean’s cliffs and the Redwood Forests. Before you embark on your journey to Elk, spend a couple of days enjoying the highlights of San Francisco. With so much to see and do in San Francisco, park your car and stay on Fisherman’s Wharf. From here you can walk or catch a cable car to many attractions and not have to worry about navigating the city in traffic. 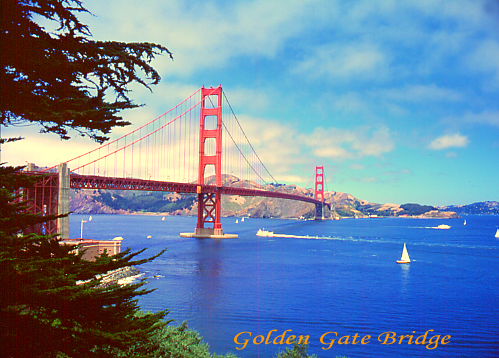 From the Wharf, you can take a cruise on the bay for spectacular Golden Gate Bridge views or cruise out to Alcatraz for a very interesting tour of the prison and grounds. Be prepared, you will need a jacket when you get out on the bay! Afterwards, enjoy a meal at one of many restaurants with Bay views. Whether you’re in the mood for a casual meal or a more elegant dining experience, you will find some of the best cuisine right here on the wharf. Visit Ghirardeli Square and the Cannery for famous Ghirardeli Chocolate, unique shops and Bay view restaurants. There is even a History Museum of the City of San Francisco located on the 3rd floor. No visit to San Francisco would be complete without hopping a cable car from the Wharf and touring the city. Be sure to get off at Lombard Street and take in the beautiful views, flowers and shrubs on the “crookedest street in the world.” Hop back on the cable car and continue on to Chinatown and downtown San Francisco, both offering abundant shopping opportunities. When you’re through, you can catch the cable car back down to the wharf for another evening of fine dining. After spending a couple of days amongst all of the people in San Francisco, you should be ready to head out to the sparsely populated, slower paced environment on the Mendocino Coast and the town of Elk. 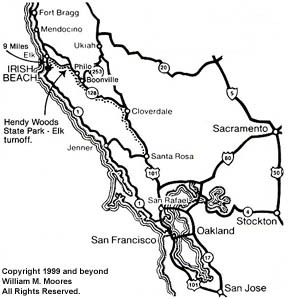 The route we suggest is a scenic loop that will bring you back in to San Francisco through wine country at the end of your trip. Cross the Golden Gate Bridge into Sausilito, heading North on Highway 1. Travel time to Elk is approximately 3 hours but you should leave in the morning allowing for a leisurely day spent at scenic overlooks and other attractions. A must stop along the way is the Muir Woods National Monument located in the Golden Gate National Recreation Area. 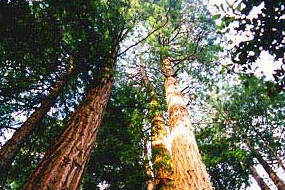 The majestic Redwoods (shown below) tower above the forest floor in peaceful tranquility. An easy stroll through the park is the perfect opportunity to stretch your legs before your journey up the coast. With so many beautiful beaches on the way up to Elk, pack a picnic basket and plan to enjoy your lunch on the beach at Jenner. Here the Russian River meets the Pacific Ocean along this beautiful stretch of the Sonoma Coast. Throw down a blanket, stroll in the surf and let the kids look for seashells. This area is known for its seal that mate here and raise their young on the offshore islands. During the seal season, Park Rangers conduct seal-watching excursions. Enjoy all of the comforts of home with a complimentary bottle of wine from a local vineyard waiting to greet you. The owners of this property have thought of everything from a fully stocked spice rack in the kitchen, hot cocoa and coffe, to local area history books on the coffee table. 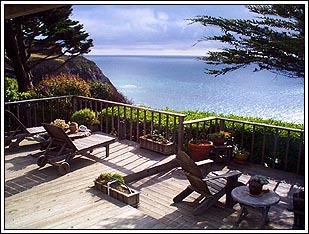 Feaures of the property include an outdoor hottub on this gorgeous deck overlooking the Pacific Ocean. You’ll want to relax and unwind here every evening under the stars. The deck is also the perfect place for whale watching during season. Inside, enjoy a romantic evening by the fireplace after you’ve cooked up your fresh catch of the day on the grill. For an extra special treat, why not pamper yourself with an in-house massage by The Body Works. Launch through the surf at Greenwood State Beach on your own personal kayak tour of the Mendocino Coast. Glide through sea caves and kelp forests, see starfish, sea lions, birds, hidden beaches, ruins of the old shipping operations and incredible panoramic views of the Mendocino Coast. A professional guide will pilot your boat, so no experience is necessary. The standard tour is approximately two hours on the water and the cost is $95 per person. 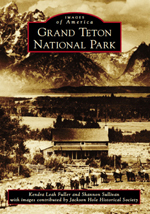 Longer outings, picnics and nighttime full moon tours are available by arrangement. Visit Force 10 Ocean Tours for more info. Go for a private ride on spectacular Manchester Beach’s miles of unspoiled sand and surf. Rocks, driftwood, creeks, birds and seastacks dot this vast expanse of beach. Look for sea lions poking their heads out of the surf to take a peek as you ride by…you may quite possibly have the beach all to yourself for your ride. Or, take a private guided horseback ride through a beautiful mountain redwood forest in the inland coastal mountains of Elk. Ride on the Ross Ranch down roads and trails among the tall coastal redwoods. The Ross Ranch is situated in the hills high above the coast with sweeping views of the valleys and forests below. The friendly guides are locals to the area. 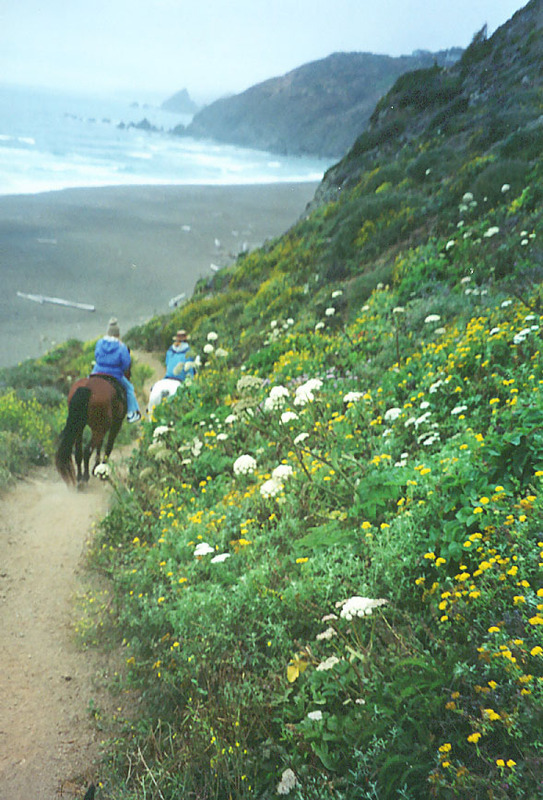 Visit Ross Ranch Beach & Redwood Forest Horseback Tours for more info. Spend the morning shopping in Mendocino then head up to Fort Bragg for an afternoon of deep-sea fishing or board the Skunk Train for a ride back in time through the Redwoods. Weather permitting, boats leave daily out of Noyo Harbor. Get your catch cleaned before you leave and take it back to the Sea Escape to cook up on the grill. Depending on the time of year, you can fish for salmon, halibut, rock cod, albacore or go crabbing. Whale watching excursions are also available November-March. The town of Elk features several wonderful restaurants, but you’ll want to check ahead and find out what nights of the week they are open. You absolutely must have breakfast at Queenie’s Roadhouse Cafe. If omelettes are your thing, their’s are absolutely delicious and the fresh squeezed orange juice is like a sip of heaven. 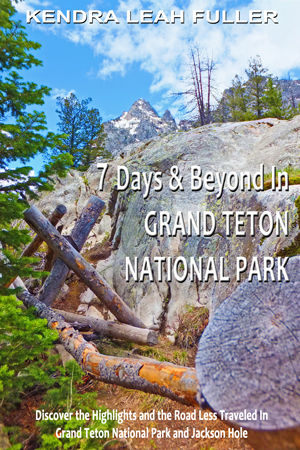 With so many things to see and do, you will hate to leave this beautiful place. Take the time on your way back to San Francisco to go on a wine tasting tour or two as you drive through the Anderson and Napa Valley Wine Regions. May we suggest the Husch Vineyards, a small family winery located in the Anderson Valley appellation of Mendocino County. Enjoy your stay on the Mendocino Coast! Come back refreshed and relaxed with many wonderful memories to savor for years to come. This entry was posted on Saturday, September 3rd, 2011 at 7:49 am	and is filed under Travel Articles. You can follow any responses to this entry through the RSS 2.0 feed. You can leave a response, or trackback from your own site.